The good: The T-Mobile G2 boasts a premium design and easy-to-use QWERTY keyboard. It's the first smartphone to support T-Mobile's HSPA+ network, and offers speedy performance and good call quality. It ships running Android 2.2 with the stock Android interface. The bad: The G2 doesn't offer tethering or mobile hot spot capabilities. We have some concerns about the slider hinge. The bottom line: Some minor issues aside, the T-Mobile G2 is one of the carrier's top Android smartphones, offering an excellent QWERTY keyboard, speed, and plenty of features. The good: The Samsung Epic 4G has a knockout Super AMOLED display, a 1GHz processor, a front-facing camera, an impressive QWERTY keyboard, a 5.0-megapixel camera with an LED flash, and supports Sprint's 4G WiMax network. It is capable of acting as a mobile Wi-Fi hot spot for up to five devices. The bad: The Samsung Epic 4G is the bulkiest of the Galaxy S phones and also the priciest. It also requires a costly data plan. The bottom line: The Samsung Epic 4G is a multimedia powerhouse with features the other Galaxy S phones don't have. Unfortunately, it comes with a big price tag. The good: The HTC Evo 4G delivered respectable 4G speeds, and the mobile hot-spot feature lets you connect up to eight devices. The smartphone has a front-facing camera for video chats and also comes with an 8-megapixel camera with HD-video-recording capabilities. The Evo ships with YouTube's HQ video player, Android 2.1 with HTC Sense, and an HDMI port. Other highlights include an extra-large 4.3-inch touch screen and a 1GHz Snapdragon processor. The bad: Sprint's 4G network is limited at this time, making the mandatory $10 premium data add-on tough to swallow for anyone outside of the coverage area. The Evo lacks support for Bluetooth voice-activated dialing. Battery drains quickly with 4G. The bottom line: The HTC Evo 4G is easily Sprint's best smartphone and one of today's top Android devices. It also shows the promise of 4G, which will grow as Sprint's WiMax network expands, but until there's broader 4G coverage, it's hard to agree with the mandatory premium data add-on fee. The good: The HTC Droid Incredible is blazingly fast, thanks to Verizon's 3G network. 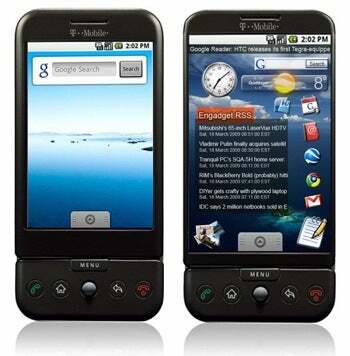 HTC Sense enhances the features of Android 2.1, and the smartphone features an 8-megapixel camera and 8GB of internal memory. Wi-Fi, Bluetooth, GPS, and 3G are all onboard. The bad: You can't use voice and data at the same time. The multimedia experience is adequate but still behind the competition. The bottom line: With its polished design and user interface and blazing fast speeds, the HTC Droid Incredible takes pole position as Verizon's top smartphone and is now the Android device to beat. The good: The iPhone 4 offers enhanced performance, a lovely new display, and an improved design. It also adds a ton of sorely needed features, both by itself and through the iOS 4 update. The bad: Multitasking entails some trade-offs, and home screen folders are limited to 12 apps. AT&T reception continues to be spotty, and you'll need a case for the best calling reception. Also, we'd prefer a 64GB model. The bottom line: With the iPhone 4, Apple again shows that it is a powerful player in the smartphone wars. It won't be for everyone, the call quality and reception vary if you don't use a case, and AT&T's network remains a sticking point, but the handset's striking design, loaded feature set, and generally agreeable performance make it the best iPhone yet.